So you’ve taken the plunge and bought your first snowmobile - maybe a couple so the whole family can travel in style. In the past, some snowmobilers ran afoul of farmers and other private land owners by helping themselves to their wide open spaces in the winter. And if this trespassing escaped the owners’ notice, riders occasionally fell prey to hazards hidden under the snow on unfamiliar routes or collided with road vehicles on snowy backroads. Today snowmobilers in Ontario are blessed with a network of groomed trails totalling over 49,000 kilometres crisscrossing the province. The trails are managed by members of the Ontario Federation of Snowmobile Clubs (OFSC) who can boast some of the safest and best-tended corridors on the continent. Ron Russell is one of the thousands of recreational snowmobilers who take advantage of this superb rural network of trails. A resident of Gilford, Ont., about 20 miles south of Barrie, Russell and his family have enjoyed "trail holidays" for nearly a decade now. Ray and Ron Russell take a moment to soak in the scenery. Before the OFSC network was set up, Russell and his wife Ray, and kids Ryan and Renee, used local, privately run trails. Today he’s an enthusiastic booster of the OFSC’s trail network. "You can travel just about anywhere in the province," he says. "In many places the trails are groomed around the clock. They’re very well maintained, marked and safe." For a reasonable annual membership, snowmobilers are treated to clearly marked trails where potential dangers are well identified and minimized. Sight lines are good, most water crossings and ditches are bridged and ice crossings are clearly outlined with stakes or trees. And, like a well-maintained road system, traffic signs abound and give riders ample warning of changing trail conditions. Last winter Ray and Ron Russell enjoyed a trail holiday in Northern Ontario, travelling from North Bay to Cochrane and back on their Ski-Doo Grand Touring machine, a stretch model they’ve affectionately dubbed "The Couch" for its roominess. It’s big enough for the couple "and a week’s worth of clothes." Russell compares his trail holidays to the boating trips he and his wife enjoy every summer on Ontario’s waterway systems: "You see things you just don’t find driving down a highway," he says. "We’ve had encounters with deer, we’ve seen waterfalls and other natural spectacles." The Russells also spend a few weekends every winter cottaging with friends near Parry Sound, taking advantage of the many trails in the area, and the ample snow they’ve been seeing less of in recent years in their own neck of the woods. 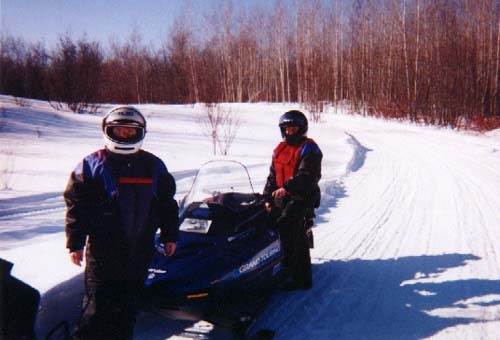 Following the detailed maps provided by the OFSC, snowmobilers can plan ambitious overland trips across large expanses of the province, or interesting daily outings through the countryside surrounding their cottage. The system can also take you to neighbouring provinces and states. Russell says many northern communities go out of their way to attract touring snowmobilers, placing signs along trails advertising hotels, restaurants and service stations. "When you travel during the winter, the hotel rates are very reasonable," Russell points out. "We look for one-stop facilities where we can get a meal, a place to sleep and pumps to fill up before we head out on our way again." On an average day of trail riding, the Russell may travel between 200 and 300 kms. over seven hours, stopping frequently to soak up the scenery. "It’s not about racing, which is a whole different aspect of snowmobiling," Russell says. The backbone of Ontario’s snowmobile trail system are the Trans Ontario Provincial (TOP) Trails. The system, built in the mid-‘90s, was a $21-million co-venture between the province and the OFSC. If you really want to get away from it all, much of the TOP system has been carved out of the bush in Northern Ontario, a lot of it running along trapper paths, abandoned rail lines and old forestry roads. Local snowmobile clubs take responsibility for marking, maintaining and patrolling trails in their area. To ride on OFSC provincial trails, you need to obtain a permit from one of the organization’s 200 trail-building clubs - the OFSC follows the "Buy Where You Ride" philosophy and can direct you to the member organization in the area you plan to embark from. For the 2000-01 season, the permit costs $150 - if you hurry and order one before Dec. 1, it’s $120. You can also get a one-day permit for $30. The permit must be affixed to the front of your snowmobile. If you don’t have one and a Trail Warden spots you, you’ll be directed to leave. For the past couple of years, the Ontario Federation of Snowmobile Clubs has instituted its "Stay on the Trail" program, touting the benefits of its network which generates nearly a billion dollars’ worth of economic benefit to Ontario.